PayPal – Payment Data Transfer Sample Code | Eureka! First of all you have to enable the PDT in your PayPal account. After you have logged in, go to Profile > More Options and the click Website Payment Preferences. Turn on the Auto Return and Payment Data Transfer as depicted in the following picture. Fill in the Return URL with the .php which can talk with PayPal with PDT. Please note that you need to create the thank.php in your web folder before it can be validated by PayPal – Remarks by yousouf @ 2011-06-03. The next thing is to create the thank.php which is the destination of the Return URL. Replace the identity token in the above code and u can test the PayPal transaction flow with PDT. You can find the sample code in the reference page. This just helped me a bunch. Thanks! Hi the returning array is empty. please help me. do you have any HTTP authentication settings in apache or .htaccess? for paypal to feed back the data to you, you have to disable the HTTP authentication. Where does the data for the $keydata array come from? ah sorry, for some reason i thought this script was to accept recurring payments from your site. would you happen to have a script for that? Sorry for the late reply. i haven’t worked on the recurring payment before. so i have no idea about that. are you using Express Checkout or Direct Payment (Website Payments Pro)? if yes, i guess the following API Documentation could help. Thanks a ton! Helped me a lot. how to get the values ‘tx’ and identity token in paypal sandbox after transaction completed. is any possible to get url values in paypal sandbox? plz anybody can help me. you don’t need to have the value of tx, it is assigned from paypal/paypal sandbox. 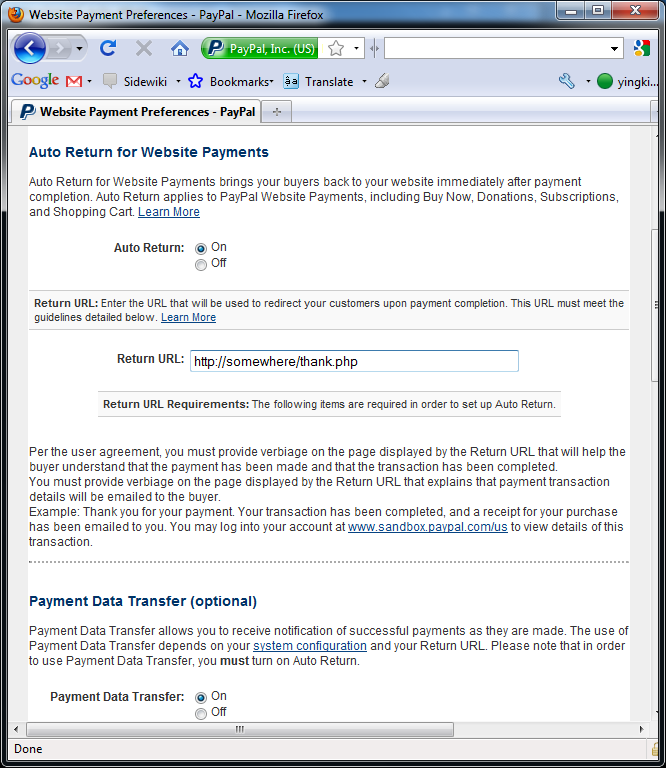 when user completed the transaction in the paypal/paypal sandbox page, it will redirect to the Return URL (thank.php in the above example) as you set in the paypal/paypal sandbox account. you can get the identity token from the paypal/paypal sandbox. as i remember, it is shown after you have enabled the PDT feature. Going crazy trying to figure out what it could be. Any insight would be appreciated. Thanks for all the info so far! oh, i think there is a typo there. I fixed it last night. The issue was that I was working on a scratch file and had not defined $header anywhere else yet. Your solution fixes it (would not have been a problem for folks who had already defined $header I don’t think) but I just added another line above it which also fixes it. Implemented it though and no matter what I try nothing shows next to price on the return url page, I want to use it with a multi item drop down, get shipping, name, item name but price is blank. Changed to a single product buy now button and still get a blank price, I’m guessing the payment_gross line is wrong for me, any ideas? are u able to get the $keyarray from the paypal server? Thanks for the tutorial. Works like a charm. I had some difficulty at first. When I gave the return url I got an error message telling me that the url could not be validated. It was only after I posted the thank.php on my website that I could finish the configuration and got the token. But then, I am a newbie. I hope that my remarks help other newbies like me. Hi ! This is by far the best tutorial on how to use PDT ! Thank you very much mate ! Thanks for this tutorial. This works perfectly in sandbox test site. Does this code need any changes when integrated with paypal site. What you need to change are the $fp and $auth_token when you switch to live. Hi! and thanks for this wonderful tutorial. I tried it and it worked perfectly with basic sample buttons, however I’m trying to get it to work with other information … like when you have a paypal pay now button with a form … like how paypal, when it generates the buttons it gives you certain options to add text fields, etc. How do you get information that is passed from those optional fields to display in thank.php? Otherwise it works just fine! i guess other form data is stored in the $keyarray too, you can print_r($keyarray) and see if it contains those form data. Hi! I have a question, hope you could help. Your PDT is displaying only one item name, what if I have to display a multiple Item name in my return url? thanks in advance. it should be item_name x. i.e. $keyarray[‘item_name1’], $keyarray[‘item_name2’]… etc. yeah, your right, I figured it out by displaying the $keyarray. Thanks! hi can I use it with Java? There is no sample code of PDT in Java. 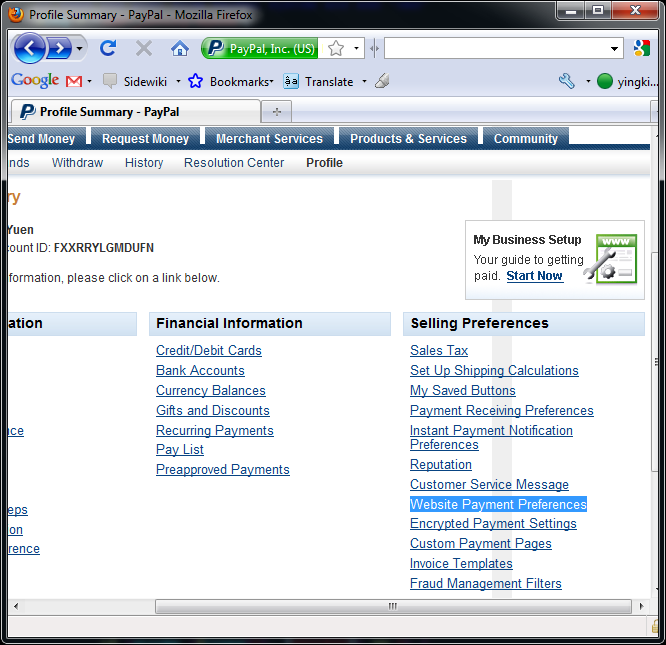 Maybe you can find more information in the following link on how to implement paypal in Java. the script doesnt output any data like firstname, lastname etc. after inspecting the $res variable it is empty only the headers are there. I guess maybe paypal has made some changes on the implementation. I suggest you could follow the example from the official page. Do you still get the same problem? Great tutorial, but I’m not able to get any response. fixes that, but now I get no reply at all. Any thoughts would be greatly appreciated. Not very sure what causes the problem. I have checked there is a new sample code provided by PayPal. Let me know if it could solve the problem. I’m running PHP 5.2 on my server, and can’t upgrade until I upgrade PHP code for everything on my site. Paypal’s code above is written on PHP 5.3. Would you know the specific changes I would need to make in the code for it to work with PHP 5.2. I get nothing back from Paypal using the above code — no errors, nothing. And the code sample in my post was written long time ago and properly i was using PHP5.2. It is hard to say what causes the problem. But i think you could check the following. 1. Make sure you are working on the correct server. PayPal or Sandbox? 2. Have you enabled PDT on your PayPal account and is your $auth_token correct? 3. Try to print some debug msgs in the code and check which part causes the problem. I want to thankful to the writer of this blog, it is really helpful. The most important thing is that even a new user can run this by just copy and paste. You made back-end process after returning from Paypal much easier. I would like to suggest the writer and user of this code , please edit QUOT in this line. actually by typo mistake these DOUBLE QUOTE are not supported in Programming so use below code instead. PLEASE NOTE THE DIFFERENCE B/W “ ” and ” ” , first one is NOT supported in programming , while second one is supported. How about with Paypal API developement? I downloaded Paypal API to our computer but looking not simple as your code, I think we need extract the code and implement class then use or other way? Some people said use this package is high security for a site purchases? Please let me know your ideas for this? I haven’t tried that before, so can’t give comment on it. In general, the API provides u more flexibility and more powerful features which the PDT doesn’t have but the trade off is it requires more efforts to implement. Hi, Your code in the comments box below worked. Please update the same on top. Thanks a lot for your help!